I’ve been interested in buying a body composition scale for quite a while so when on a recent business trip to Scotland I stumbled across this one in Decathlon I decided to take the plunge. It outputs all the right measurements and at only £15.99 certainly won’t break the bank. Since then I’ve been weighing myself each morning as usual but now I’m recieving more data for my effort! Alongside weight, I’m also measuring my percentage fat, total percentage water, percentage muscle mass and my total bone mass. So, lots of data. But is it of any use? That’s one of the things that really sprung to mind when I read that the scale displays bone mass as one of it’s measurements. I mean, really? Bone mass? However, what I’ve discovered is that I can use the bone mass value to prove the quality of the other readings. When I first started using the scale I used it just the same as my previous weight-only scale. I weighed myself just prior to getting into the shower. 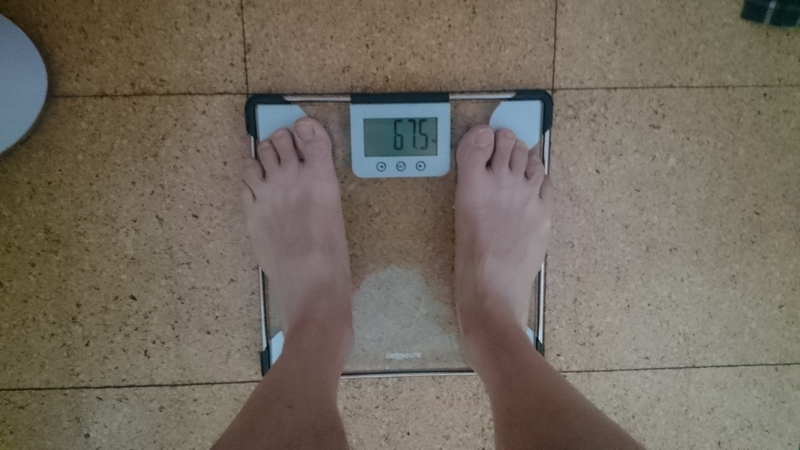 However, this new scale doesn’t like that, the extra values beyond weight require a good electrical contact between your feet and the metal strips as it works by ‘bioelectrical impedance’, so I’ve found that I get much better results (more accurate) by using these scales after my shower. I towel down first ignoring my feet which dry a little anyway as I’m stood on a towel and then I step aboard the scale which is also a little damp from condensation. So what’s that got to do with ‘bone mass’? Well, when I first started using the scale my bone mass could be anything from 2.3 kg up to 3.0 kg. Obviously, if I weigh myself one day and I’m 3.0 kg and then the following day I’m 2.3 kg, then I know the scale is playing up; I’m not going to have lost 0.7 kg of bone overnight! Now that I’m weighing myself with enough dampness between the scale contacts and my feet, I consistantly get 3.0 kg for my bone mass; hence I am now confident in the other readings too! So the other readings: I get 12-13 % fat, 44-45 % muscle and around 66 % water. Good, bad or average? Who knows and who cares… I’m looking for my own trends not to compare myself to others. Particularly I’m wanting to make sure that if I drop my weight, it’s fat that goes and not muscle mass; cycling is all about power to weight ratio, so it’s no good to loose weight if it’s muscle that you’re loosing! So my data is all going into Training Peaks. I can’t show off any graphs as I don’t have the premium membership right now but I know it’s all there for when I do. The scale doesn’t have bluetooth, wifi or any auto-logging features but that’s no real issue as I can easily tap 5 pieces of data into my phone each day. Ideally I wanted a wifi scale that would auto sync my data to training peaks directly but I couldn’t find such an item so I’m happy with what I bought, especially as it was only £15.99.